Senator Joe Manchin (D-West Virginia) is looking at a Canadian style single payer system. 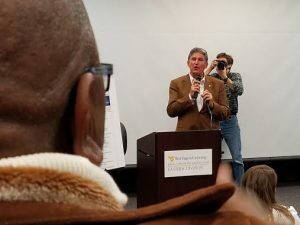 It’s the second time in a month that Manchin has told constituents that he’s looking at a Medicare for all system to replace an unraveling Obamneycare. Manchin has been clear that he will vote against the emerging Trumpcare/Ryancare that will balloon the ranks of the uninsured from 30 million under Obamneycare to 50 million. A single payer system would leave zero people uninsured. Under single payer, every citizen gets a birth certificate and a Medicare card at birth. The United States pays per capita more than two and a half times more than industrialized countries with single payer systems. 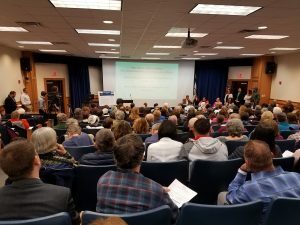 At a town hall meeting in Martinsburg, West Virginia today, more than 200 people jammed the Robert Byrd Science Center. Almost a quarter of the twenty or so questioners called on Manchin to get behind single payer. 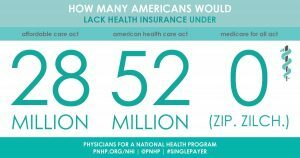 HR 676 – the single payer bill in the House – has 65 co-sponsors. No Senator has introduced a similar bill in the Senate. And by their reactions to single payer questions, the majority in the room wanted Manchin to sponsor a single payer bill in the Senate. “Neither does our system,” one person yelled. “They don’t let you come every day to a doctor here,” yelled another attendee. “We are open to all of these things,” Manchin responded. “Bernie Sanders hasn’t introduced it in the Senate either – why hasn’t Bernie introduced it?” Manchin shot back. When Manchin questioned whether a single payer system would cost more than what we are paying now, Lynn Yellott responded that according to a Commonwealth Fund study, 95 percent of Americans would pay less money than they do now – in terms of co-pays, deductibles and insurance premiums. “I hope that you will take a close look at it,” Yellott told Manchin. The session ended with questions from two citizens who spoke in favor of a single payer system. “I’m open to everything and anything,” Manchin said.